For a couple months now, most of the windmills on the old Bethlehem Steel property haven't been turning at all. Norman Polanski, Lackawanna Mayor, "They're not turning plain and simple. That's what everybody keeps calling me about; the windmills aren't turning." They all started turning for the first time in June. 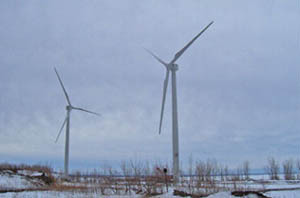 This Steelwinds Project was the first to use the newest Clipper Wind turbines, touted as the new standard for reliable performance, but by late summer, engineers discovered damage inside one of the gear boxes and then shut down 5 others because the timing was off in those gear boxes too. A Clipper Vice President tells me the plan now is for a crane to arrive next week to take all of the gear boxes down send them back to the factory in Iowa and then replace them one by one throughout the winter. The towers will still stand, but the blades will have to come off of all eight wind mills. It could be March or April before the job is finished. Norman Polanski, Lackawanna Mayor, "I know if I owned a company and I wasn't making any money, I wouldn't be a very happy fellow, so I can't believe they're satisfied with the status they have right now." But Mayor Norm Polanski says whether they're turning or not, it will not stop the 100-thousand dollar annual payments the city receives from BQ Energy. Norman Polanski, Lackawanna Mayor, "From the sense of us receiving our revenues, no. From the sense of people wanna see them, people love to see, people wanna see 'em turn." "Updates" is an adjunct to our main Cohocton Free website that provides regular news and commentary about the Cohocton wind power controversy. Feel free to browse our postings and offer your own comments. When you reply online, all we ask is that you identify yourself, rather than choosing to remain "Anonymous." Feel free to check my Blogger profile to find out more about me. Subscribe through our RSS Site Feed or by Email to get "Updates" on a regular basis. VN 12/3 - What Advantage? VN 11/27 - "Huge Tax Cut"? Click here to view PowerPoint, The Hills and Sky of Cohocton. Click any of the images below to see photos posted on Flickr. Got pictures? Email them to us! Call 384-5610 or click here for more information. Click for our Community Calendar.